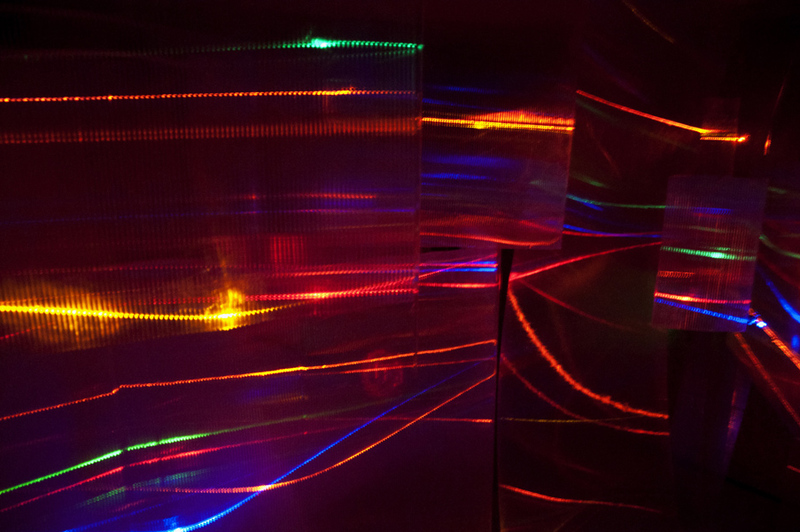 In this all-encompassing maze-like installation, LEDs form colored lines of light when reflected off translucent ‘walls’, confounding any sense of orientation. The viewers, as they walk inside the piece, complete it through their process of discovery. During performances, dancers wearing lights move through and activate the light-based artwork, creating moving lines of light. “A Sound Of Light, appearing around the bend” is in many ways inspired by a previous piece, entitled “The Cave”. The artist explains that “'“The Cave” originated in a cave in Cappadocia, Turkey, during an artist residency at the Babayan Cultural Institute in 2012. The feeling of scrambling through a disorienting maze of ancient caves during my morning walks translated into a maze of colored light. Villagers visiting this cave were delightfully disoriented, reacting spontaneously by interacting with their cell phone lights.”. At FiveMyles, “A Sound Of Light, appearing around the bend” will bring this experience, on a larger scale, to the New York public. Barbara Campisi has exhibited her installations and related paintings and drawings widely in NY and nationally. She has shown at Schema Projects, Brooklyn, NY, Firework Gallery, Brooklyn, NY, Momenta Gallery, Bushwick, Brooklyn, NY, Gallery Thomas Jaeckel in Chelsea, NY, the Tang Teaching Museum in Saratoga Springs, NY, the Gg Gallery in Brooklyn, NY, the Islip Art Museum in Islip, NY, 80 Washington Square East Galleries in NY, NY, Danny Simmons Corridor Gallery in Brooklyn, NY, Eyewash at Supreme Trading, Williamsburg, NY, Girdle Factory, Brooklyn, NY, Tenri Cultural Center, NY, NY, The Kleinert James Gallery, Woodstock, NY, Byrdcliff Arts Center, Woodstock, NY and the Candid Gallery, London, England. She has been granted fellowships to the following artist residencies:L MCC and Creative Capitol’s Artist Summer Institute, the Bau Institute, Otronto, Italy, Virginia Center for Creative Arts, Amherst, VA , Babyan Cultural Institute Cappadocia, Turkey, Fundacion Valparaiso, Almeria, Spain, The Ragdale Foundation, Lake Forest, Ill. and Byrdcliff Arts Colony, Woodstock, NY. Barbara’s work has been written about and reviewed in The Brooklyn Rail, The New York Times, Newsday, The Woodstock Times, WG Arts + News, Cover Magazine and Waterfront Week. It is held in private collections throughout America and Europe.